Take a pan and heat oil. Add cumin seeds, asafetida, garlic-green chillies paste and stir it for 2-3 times. 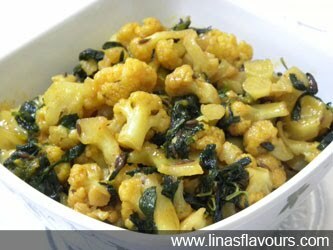 Add cauliflower florets, salt and cook it for about 4 minutes. When it is half done, add fenugreek leaves, garlic paste, green chillies, turmeric powder, close the lid and cook it for about 4 more minutes or till it is done on medium to low flame. Add sugar, lemon, mix it well and cook for 1 more minute. Serve it immediately with roti, paratha or puri.